The avocado is a temperate- to tropical-climate tree that produces pear-shaped fruit. Black leaves on an avocado tree are a symptom of numerous diseases that can limit fruit production and tree vigor. Identifying the cause of the blackened leaves, preventing disease infection and controlling the problem is vital for managing avocado tree diseases. Anthracnose, caused by the fungus Colletotrichum gloeosporioides, is a serious disease of avocado trees. The disease favors free moisture and wounds on leaves for infection. Anthracnose infects the leaves through weakened areas, which occur from insect, wind and disease damage. The disease first appears as small, irregular, black spots on leaf and fruit surfaces. As the disease develops, the black fungal spots expand, which causes blackened leaves or fruit. Because anthracnose can spread to twigs and avocado fruit, control the disease as soon as symptoms appear. Pseudocercospora spot is a fungal disease of avocado, caused by the fungus Pseudocercospora purpurea. 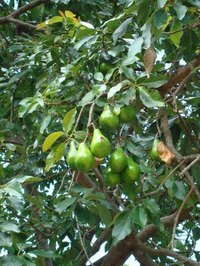 The disease favors warm, humid climate conditions and free moisture on avocado fruit and leaves for infection. Pseudocercospora fungi produce small brown to purplish lesions on leaf surfaces, measuring .079 to .197 inches in diameter, reports the University of Florida IFAS Extension. As the disease develops, the lesions turn a dark brown to black color, causing necrosis or dead tissue on infected areas. Avocado root rot is a fungal disease that affects foliage, fruit production and root systems of avocado. The disease, caused by the fungus Phytophthora cinnamomi, is the most serious avocado disease, states the University of California, Davis. Conditions that favor the disease include excess soil moisture from heavy rainfall or overwatering, and poor soil drainage. The fungus spreads from tree to tree from water that passes through infected root systems. Symptoms of infection consist of small, pale green to yellow leaves, leaf death or necrosis, branch death and decreased fruit production. Leaves that become necrotic turn brown to black and wilt on the tree. The University of Florida IFAS Extension recommends using fungicidal sprays on damaged trees to prevent anthracnose infections. Fungicides are an effective method of prevention and control for Pseudocercospora leaf spot infections. Copper or azoxystrobin fungicidal treatments are effective fungicides for reducing damage from Pseudocercospora fungi. Prevention of avocado root rot consists of cultural controls, such as providing good soil drainage, planting resistant avocado, restricting water movement from infected trees and preventative fungicidal control. The University of California, Davis, recommends soil solarization, which is the process of laying polythene sheets on soil to heat the ground temperature to 108 to 131 degrees F. This process kills Phytophthora cinnamomi fungi and reduces infection rates. Fungicides are an effective method of control after infection occurs.